Doughnuts are great. I am however scared of deep frying. I just can’t get over the worry that I’ll burn my house down. And then disposing of all that oil? Urrgh. Just before Christmas I bought a Doughnut Oven Bake Baking Tray (this one), and you know what? It’s f****** brilliant. In the run up to Christmas I made a few different types. From standard cinnamon sugar, through to maple glaze with crispy bacon. I didn’t however, get around to blogging any of them. So here we go! I passed my probation the day before the Christmas holidays started for me. When you pass your probation, it’s tradition to bring in a selection of Krispy Kreme Donuts for the office. Everyone runs late on it, and I wanted to bake my own. So I’ve decided to bake a selection of different doughnut types. Lemon Glazed, Maple Glazed, and Chocolate Glazed. To keep things tidy I’ll do 2 separate posts with the recipes. Starting with the Lemon Glazed lemon Doughnuts. This recipe is based on this one here. The great thing about oven baked doughnuts, is that they are good for you slightly less bad than normal ones. They don’t take too long and you can satisfy a craving pretty easily. Now, one more time DOUGHNUTS. DOUGHNUTS. DOUGHNUTS. 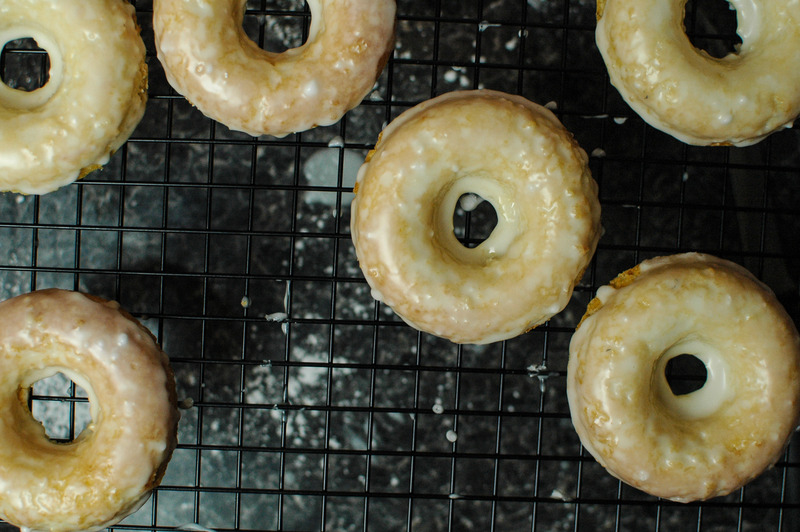 Preheat the oven to 175°C (155°C fan assisted) and grease your doughnut tin. Beat the egg with the buttermilk, melted butter and vanilla. Pour the egg mixture into the dry ingredients, add the lemon rind and mix until just combined. Divide the mixture in the tin. I did this using an icing bag for neatness, you could easily do it with a spoon too. Fill each ring to about ¾ full. You don't want them rising up and filling the whole in. Bake for 14-17 minutes, the edges should have started browning and a tooth pick inserted will come out clean. Remove from the oven and leave to cool in the tin for about 10 minutes before turning out onto a cooling rack. While they cool, make the glaze. Beat the lemon juice into the icing sugar until smooth and thick. Once the doughnuts are cool enough, dip them in (I double dip) so the top is coated with the glaze. Allowing to set before serving.